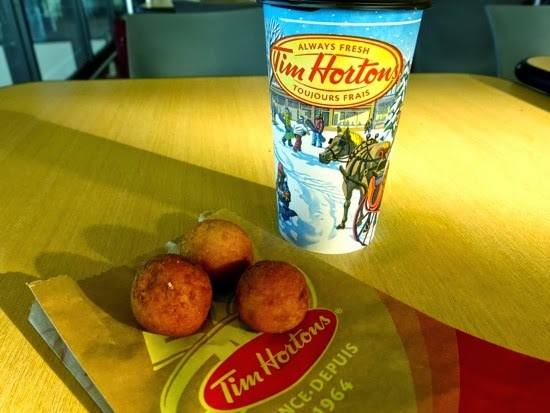 Timbits and coffee at Jean Lesage International Airport in Quebec City. Photo by Sue Frause. I didn't realize Tim Hortons turned 50 until I arrived at Quebec City Jean Lasage International Airport. It's my size airport, and after checking my bag through to Seattle (via Air Canada to Montreal and Vancouver), there was a Tim Hortons glowing bright right before security. Gotta have my Timbits! If you're not familiar with Timbits (pictured here before I devoured them), they're the brand name of doughnut holes sold at Tim Hortons. They were introduced in 1976 and available in various flavors that differ from store to store. But I prefer the plain cake doughnut hole. Back to Tim's golden celebration. First off, they introduced cups featuring the new 50th anniversary logo and 50 Years Fresh tagline. Although it looks like my cup here at the airport is leftover from the holidays, the bag with the Timbits has the new look. Tim Horton opened in Hamilton, Ontario in 1964 and today they have 4,350 restaurants across Canada, the US and Gulf Cooperation Council (read my post about their restaurant in Dubai). They claim to serve nearly eight out of every 10 cups of coffee served in Canada! The chain was founded by professional hockey player Tim Horton, who died in a car accident in 1974. Tim Hortons 50th anniversary party will be held May 17, 2014. In the meantime, you can follow them on Twitter and Instagram (@TimHortons) and via #Tims50th on Facebook. Read more about Quebec City at my EatPlaySleep blog.